Although I am still recovering from the jet lag, my vision has cleared enough now that I can pen my thoughts on Office 365 Nation 2014 recently held in Seattle. The event was put together by Harry Brelsford and in another way is really SMB Nation 2014, however this time the theme has been ‘rebooted’ to focus on Office 365 and the cloud. unfortunately, there are no slides for my informal Azure session as it was mostly demos and actually went for over two hours! Thanks to all who stayed late to listen to my thoughts. The next thing I need to do is thank everyone who attended my sessions. The first two were quite late at night, which after a long day, I appreciate you coming along and being an enthusiastic and attentive audience. I also appreciate all the great feedback and questions received in all sessions. And I really appreciate that you laughed at my jokes, corny as they were! One of the high points of the conference for me was the number of people coming up to me in the hallways letting me know that they read my blog and perhaps a particular post I wrote had helped them. Publishing a blog can be lonely at times, sure you get blog comments but it is so fulfilling for me as a content creator to actually have someone say that what I have created has actually helped them face to face. It makes the whole creation process worthwhile and gives me the energy to continue doing the blog regularly and improving the quality and depth of what it contains. With over two thirds of attendees attending SMB Nation for the first time it was brought home to me how many are still struggling to find their feet in this new cloud world. Everyone in attendance appreciates the cloud is here and that Office 365 is a great option but they are struggling with how to integrate that into a successful and profitable business for themselves. The biggest reason for this struggle in my option is that fact that most vendors are still pushing the ‘Managed Service Provider’ (MSP) mantra which I believe doesn’t make a great of sense in this cloud-first world for many. It can play a part, but these days it is only a small part in a cloud business. However it seems to me that too many people have become too locked into things only working in that MSP way and from where I sit, the world is now a very different place. In saying that, I’d really like to see business models and ideas come to the forefront that challenge that traditional notion so much so that I think I’ll post a few articles on business very soon, so stay tuned for that. In short, I believe the path to success in many ways requires a completely new way of thinking. You don’t have to totally abandon your existing business model but you do need to challenge it. You do need to start thinking outside the box and challenge the conventions to find what works best for your business. This is where most struggle I believe. They are trying to put the round peg of the way they have always done things into the square hole that is cloud services. So to provide more light on that I promise to do some follow up posts focused on business for people. I think that this conference had a some very high quality speakers and none more so then Tom Moen from Microsoft. I am so glad I attended his sessions and got to meet the man. I learned a lot about technology and presentation techniques from him. That alone made my whole trip worthwhile. Of course the real value in these conferences is the hallway networking, sitting down with peers over breakfast, a coffee, dinner or a drink. It was fantastic to catch up with old acquaintances and past SMB Nation attendees. However, it was also fantastic to make so many new connections and talk with others whom I had never met before about their business and the challenges of the cloud. This is also where I learnt a lot and I appreciate every one of those interactions. So in summary, it was a long way to travel but a real benefit for myself. I thoroughly enjoying presenting my sessions and listening to some other outstanding ones. However, most of all I enjoyed the peer to peer networking and the opportunity to be at the kick off for many along a journey to successful cloud consulting. My hope is that Harry’s event becomes the pivotal one for SMB cloud resellers as it was for SBS resellers all those years ago, because there really isn’t anything I have seen that speaks specifically to the SMB IT reseller in the cloud space now. These are the people that manage technology for the gigantic number of small businesses out there that power the economy. If SMB’s can grow then the economy as a whole grows and everyone benefits. For that to happen SMB IT resellers need to retool their skill portfolio and a focused conference like this provides no better way to achieve that. So if you haven’t jumped on board the Office 365 Nation train, then I’d recommend it is time you did. Well done Harry. Well done SMB Nation team. Well done everyone who attended. I’m keen to come back next year and I hope I’ll get the nod to speak again. One of the real benefits of using virtualization is the fact that upgrading is generally much easier than with physical machines. a case in point. 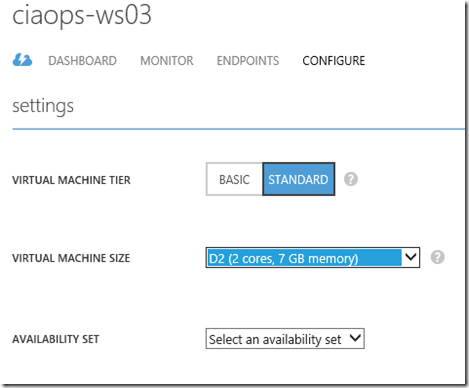 In a previous post, I mentioned how Azure now makes available machines that use solid state drives (SSDs). This allows disk access to be much faster, therefore improving the overall performance of the machine. These new SSD virtual machines are of course more expensive but for the demo and testing purposes I need them for, it makes sense. Now, if I had to perform this type of upgrade on a physical machine it would generally mean buying a new machine and doing a complete rebuild, which as you can appreciate is very time consuming. Even if I had these machines virtualized on a host machine I ran myself it would mean buying and configuring a new host machine and copying the virtual machine images onto this. That would also take a long time given that virtual machine images can be gigabytes and gigabytes in size. 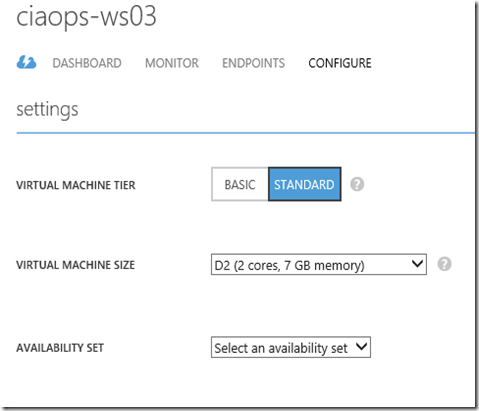 However, with Azure upgrading my virtual machines to take advantage of the latest features is a breeze. Here’s how. I then locate the Virtual Machines menu option on the left and select it. I then locate the virtual machine I wish to upgrade and select it. I then select the Configure menu option across the top, which shows me the screen above. In there you can see that current Virtual Machine Size is A3 (4 cores, 7GB or RAM). What I do is simply pull this option down and select a new machine that is utilizing SSDs, in this case D2 (2 cores, 7GB memory). I then select the Save option at the bottom of the screen to update the changes for my machine. Now if the virtual machine you are upgrading is running you are prompted that it may need to be rebooted to apply the changes. In most cases you want to make these changes with the machine off, which it is in this case, so press OK to apply the changes. Azure now hums away updating the machine. and a few moments later it is all done and my machine is now running with SSDs. You can then return to the main Virtual Machine Console, select the machine and then the Start button at the bottom. You machine will start spinning up and you can then use it without having to install any software or do further upgrades. How easy was that? 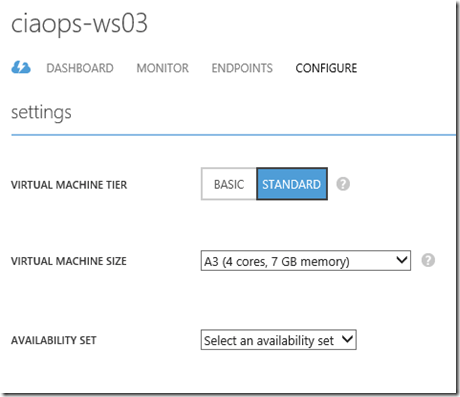 This is the way all hardware upgrades should be and the reason why you should be using virtualization and even more so why you should be using a service like Azure. It removes all the pain from the things that keep you from doing what you want to do when it comes to technology. 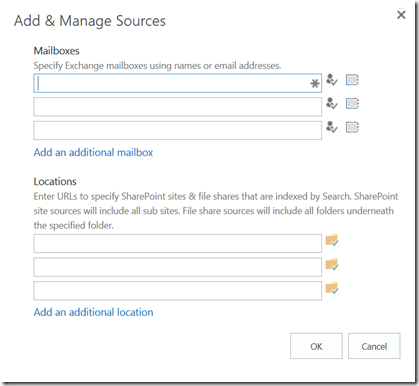 Office 365 provides the ability in all plans to search across all mailboxes. What I’ll cover here is how to do this with the Small Business Plan as that is the most challenging given that Exchange Online console is not exposed by default. If you have an M or E plan simply follow on from when the Exchange Online console comes into view. The above screen shot shows a user with a single email in their inbox we will search for. In this case we will be searching for the text “Rescuetime”. 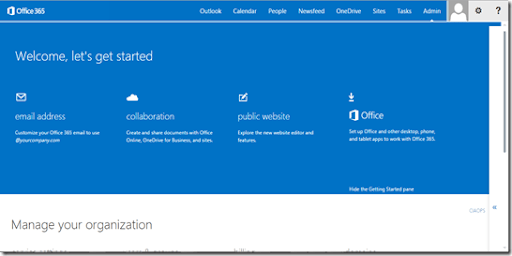 Login into the Office 365 portal as a tenant administrator. When the Exchange Online console appears select permissions from the left hand side. By default no user is given the ability to search through all mailboxes, not even global administrators. So the first step in the process is therefore to allow this. 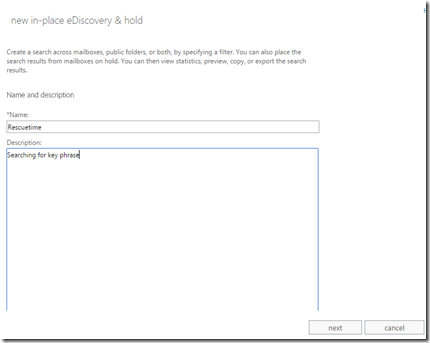 Once permissions is selected, select Discovery management to the right as shown above. Now select the pen icon at the top to edit this security group. At the bottom of the dialog that appears, in the Members section, press the + button to add a new member. 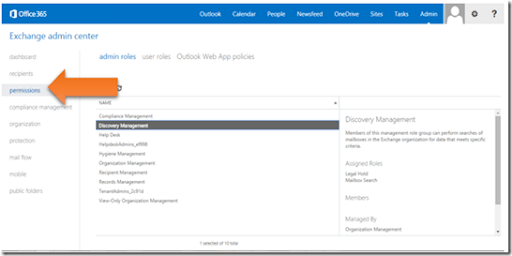 Select and add the Office 365 users you wish to give these discovery rights to. Press Save to update the permissions. You may need to log out of the web portal and log back in. You may also need to wait a few minutes until the rights have been updated. Once you have select compliance management from the menu on the left. Unless you see more than 4 icons at the top of the table you do not have the discovery rights. Only when you do will you see all the icons as shown directly above will you have the rights to search across multiple content. Press the + key to create a new search. Give the new discovery search a name and description and select next to continue. In most cases you are going to want to search all mailboxes, however it is possible to specify which ones you wish to search. Press the next button when you have made your selection. Now you can specific the filter criteria for your search. In this case we need to search for the keyword ‘Rescuetime’. Press the finish button when complete. The search will execute immediately. The time taken will depend on the information your are searching for and how much information it has to search. Press the close button to continue. You should now see the item just created listed. 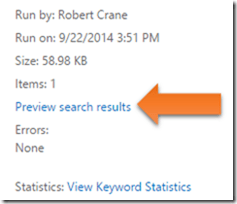 If you scroll down the dialog on the right you will see a hyperlink Preview search results. Select this. 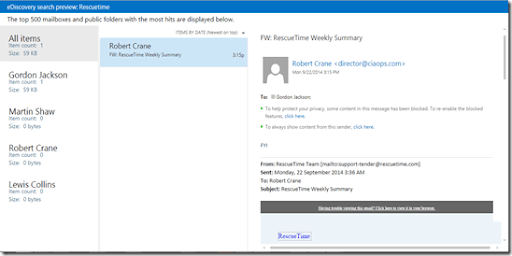 You will now see an Outlook Web Access style interface with all the matches located. With the item selected you can also use the download button to save the results to a PST file for offline review. You can of course return to this query at any point in the future, edit the query and save it to re-run the search. This makes it very handy if you need to search for things on a regular basis. In summary, all plans have the ability to search across your users data (in this case email). Some plans also allow you to place searched information on hold so that it is retained even if deleted by the user. You will firstly need to grant the person doing the searching the rights as a member of the Discovery Management group. You then create a query based on your requirements which you can view online or export to a PST file for offline view. 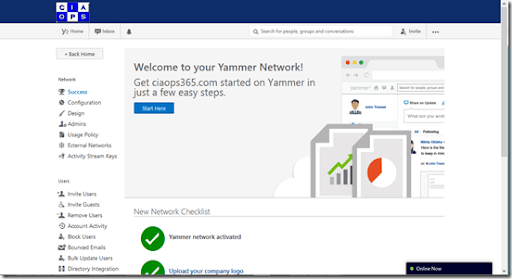 A while back posted some information up about getting Yammer via Office 365 working. 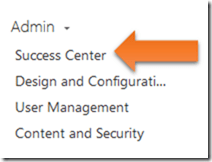 Once you have the integration in place and an admin user for Yammer, when you login to Yammer should be able to access the Yammer Success Center as seen above. If for some reason you do not see the Yammer Success Center look to the bottom left of the page. Under Networks you should see Admin if you are a Yammer administrator. When you select Admin you should see the above menu displayed. From this menu select Success Center. You will notice that is quite different from the free version of Yammer. This is Yammer Enterprise, thanks to your Office 365 subscription. You can work down the checklist in the middle of the page or the list of items in the top left. 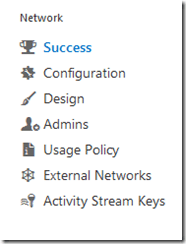 I’ll spend more time in upcoming posts diving a bit deeper into these but for now ensure you can get to the Yammer Success Center and have a look around at the different options that are available to you as a Yammer Administrator. If your Office 365 plan includes the option for litigation hold then it is generally best to turn it on for all mailboxes from day 1. 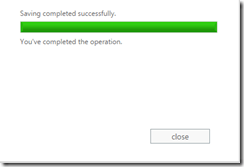 The quickest and easiest method of doing that is via PowerShell. Of course, it won’t automatically enable any future mailboxes your create but all you need to do is run the same command again. 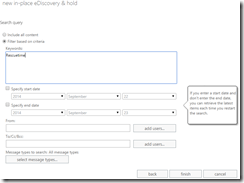 One of the great ‘enterprise’ features you receive with the higher end Office 365 plans is eDiscovery. 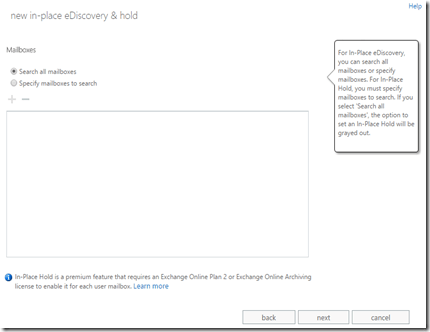 This basically allows you to trawl through all the information you have in Office 365 looking for matches to your query. 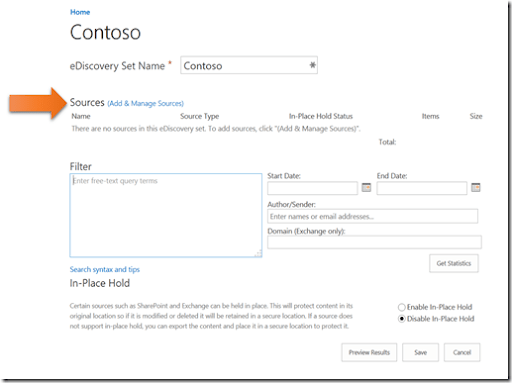 It is important not to overlook the fact that the SharePoint Online eDiscovery centre can be used across SharePoint Online and Exchange Online. So if you create a new eDiscovery Set, you then need to define the Sources that the set will work across (i.e. search through). You do this by selecting the Add & Manage Sources hyperlink. 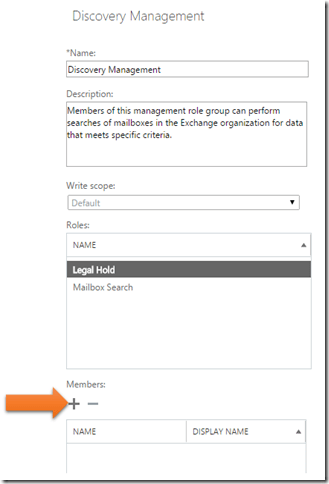 You’ll then see this take you to a dialog where you can select the individual mailboxes you wish to search along with any SharePoint locations. But what happens if you want to search across multiple mailboxes? Do you have to enter them in individually? In this case, because there are already email distribution groups established we can use these to select a group of users. Here there is an existing email distribution group called Sales Team. If you therefore enter the distribution email group into a mailbox location and select the Check Name icon to the right, you should see a green tick appear to the left indicating that it is valid. When you save this source you should then see that all the mailboxes of the email distribution group have been added as Sources for eDiscovery. 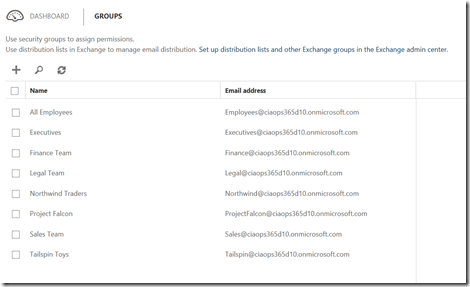 Thus, if you want to include every email inbox simply create or use an email distribution group in Office 365 that includes all mailboxes.